I just listened to this record from a friend of mine. Not happy. This record sounds quite bad: lots of pops, hiss and crackle. Still hoping in a digital (audio cd) edition, maybe with the genuine original mix of the titles tunes. I wouldn't pay a penny for this vinyl edition of my Holy Grail TV score. 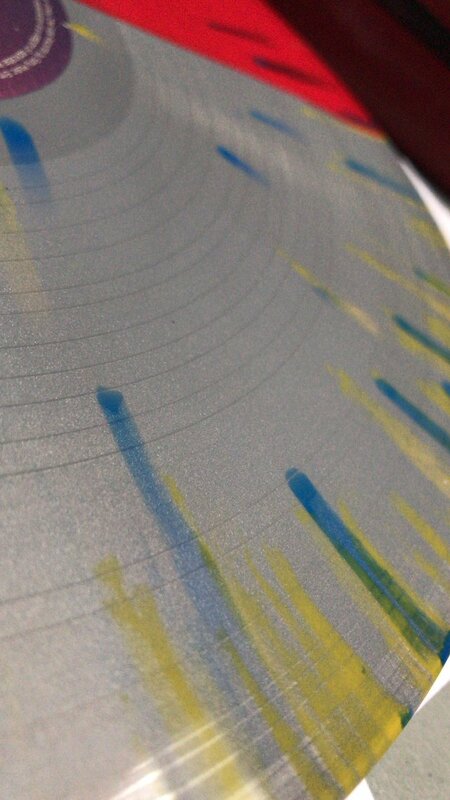 This 12" is a beautiful object for our eyes, but I listen to the music using my ears and they are still bleeding after listening to it. You know, it's interesting you note this... I've done three transfers of my copy to digital format, the highest quality I can, purchased a new pre-amp for my turntable, special record cleanser and still some of those cuts on the album still exhibit pops and such. I'm thinking of asking a friend of mine with a better turntable setup if I can test it out, just to see if the sound is any different. Well, you are right about the quality of the record. It wasn't that expensive, but you can hear the bad quality. Reocrds don't need to sound this bad. Besides that, it is a great listen. This works as an album, although I would have chosen to do, either just Season 1, or just Season 3 music. Or a different Season on each side. It's not, in fact, the better the set-up, the better you can hear the faults in the pressing. Could it be the source tapes? It'd be weird (as in "boycott-y") if each printing had improved sonics than the last. Also, I wonder if the e-mail alerts they've gathered (mine included) would indicate to them how many customers really want this. That is, if they like money. @EnjoytherideRES Where's that Transformers re-press?? 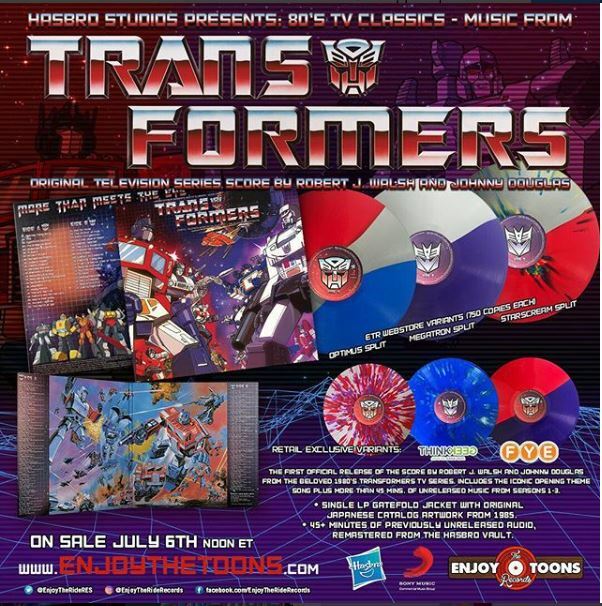 On June 30: "#ETT016 repress coming soon #Morethanmeetstheeye"
"Behold one of the THREE new #EnjoyTheToons web store exclusive variants for our #Transformers #G1 tv show soundtrack vinyl reissue! More info on full pressing and on sale date/time coming later today"
It's very tempting to start a collection of different coloured Transformers records, but it's not cheap and in the end it's about the music, so I'll stick to my yellow version. But it's great for those who missed out! It might not be exactly what we wanted, it's still a very enjoyable listen. Agreed. I thought about grabbing another variant but it just feels indulgent. I have a copy of the Optimus Prime variant, so I should just be happy. I'll save my money for what I hope would be coming down the pike, that being a volume 2 or perhaps music from another of those 80's animated classics. And by the way, it's still so great that at least some of this music is on disc! 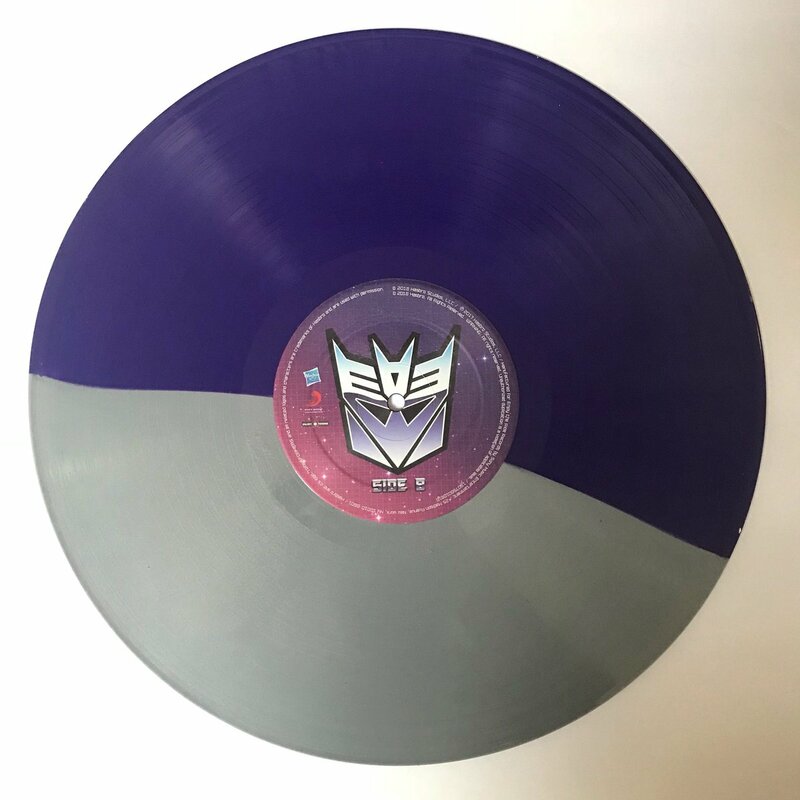 The first pressing of the Transformers vinyls sold out in five minutes. The second pressing isn't anywhere near selling out after a whole month! Well, at least it will provide other fans a chance to find it and grab a copy, I think that's a positive. I read that some fans were interested in but found out too late that the LP was even released. It's still such a strange way for this music to be released in this fashion, it's way to "vintage" for its own good. Sony should have at least allowed for a digital copy to be made available. I'm concerned that ETR records is such a small, niche label that who knows when or if we'll ever see additional volumes of music, whether from TF or other Sunbow shows. I'm concerned that ETR records is such a small, niche label that who knows when or if we'll ever see additional volumes of music, whether from TF or other Sunbow shows. "@EnjoytherideRES Just noticed that the labelling on this upcoming LP: "Hasbro Studios Presents: 80's TV Classics - Music From" There's been mention years ago of a Hasbro Classics Soundtrack Series - I'm assuming that you've got some more tunes coming from other Hasbro series? They "liked" my tweet. I am assuming that there are more in the works but that they aren't allowed to talk about them yet - I suspect more is on the way. I'm also still hoping that there's still some work going on in the background on this. Shout Factory put the movie out on Blu-ray, and they have handled all of the TV DVD releases. I wouldn't be surprised if they are working on a Blu-ray release, and maybe that rumour 5.1 soundtrack release. One can hope. 25% off everything in store until Sunday night, including the Transformers vinyl, when you use code Springcleaning. No sign of a Transformers CD, alas, nor a GI Joe or Jem release.